Transcription factors (TFs) are proteins that regulate the transcription of genes, which is the first step in making a protein. The way TFs work is by searching the entire genome and binding to specific regions that regulate genes, turning them "on" or "off". TFs are known to not only bind to specific sequences of DNA, but also to non-specifically bind to any stretch of DNA. This non-specific association can drastically increase the ability of TFs to find their specific target sites by allowing them to slide along DNA. However, we do not understand how the more than 1,500 human TFs vary in their efficiency to scan the massive genome, locate and bind specific sites. Now, the lab of David Suter at EPFL's Institute of Bioengineering has found a way to predict the efficiency with which different TFs scan the genome in living cells. The scientists studied 501 TFs in the mouse by looking at how they bind to "mitotic" chromosomes, a property that has been linked to the ability of TFs to associate with DNA in a non-specific manner. 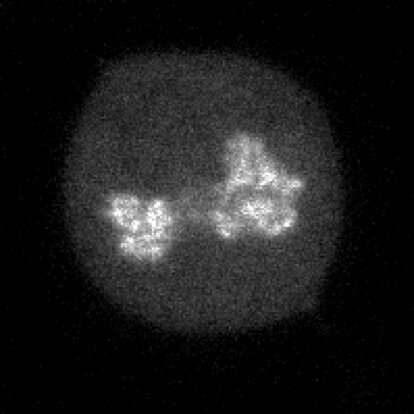 Using photobleaching experiments and single molecule imaging, the scientists found that TFs movements in the nucleus and the efficiency at which they find their binding sites can be predicted by mitotic chromosome binding. By combining these experiments with the TF mapping in the whole genome, they found that different TFs vary by three orders of magnitude in their ability to find their sites. Thus, TF with strong non-specific DNA binding properties associate with mitotic chromosomes, move slowly in the nucleus and are particularly efficient at finding the specific sequences they need to bind to regulate gene expression. "Transcription factors differ largely in their ability to scan the genome to find their specific binding sites, and these differences can be predicted by simply looking at how much they bind to mitotic chromosomes," says David Suter. "Transcription factors that are the most efficient in searching the genome could be able to drive broad changes in gene expression patterns even when expressed at low concentrations, and can therefore be particularly important for cell fate decision processes."